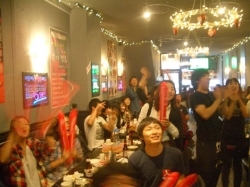 We had event for watching on FIFA World Cup match between Korea and Nigeria with Maple members on 3pm June 22, 2010. We wished all together our victory and the round of 16. The match between Korea and Nigeria was so exciting and breathtaking. We had sharing 10 baskets of fried chicken and beers during the game. We felt closer friendship and unity one another on that day. Korea verses Nigeria was finished tied at 2 to 2 and Argentina defeated Greece by 2 to 0 at the same moment so that we were able to go automatically on top of 16. We will also expect the next match with Uruguay on coming this Saturday. We had a great and wonderful day.